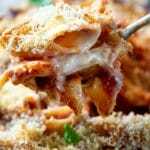 A delicious tomato pasta bake (pasta al forno) made with a rich tomato sauce, giant penne pasta, a creamy, cheesy taleggio cheese sauce and topped with crunchy breadcrumbs before being baked to perfection. Next make the cheese sauce by making a roux with butter and flour in a seperate saucepan (see notes). Add the milk slowly whilst whisking until it starts to thicken. Add the taleggio cheese, salt, pepper and nutmeg and stir until the cheese has melted and is thick. Turn the heat off and keep warm. Add the butter to a saucepan on a medium heat. Once melted add the flour and stir with a wooden spoon to form a paste. Stir the paste for 1-2 minutes to cook out the floury taste (important for the taste of the sauce). Next start by add the milk a little at a time whilst whisking to avoid any lumps. Under cook the pasta by around 3-4 minutes because it'll then be baked in the oven for 30 minutes to cook further. Use homemade breadcrumbs for this bake, they're totally different from store bought and make a difference to the end result.